One-quart (32 oz.) 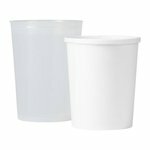 Reusable Plastic Tubs (#121) are translucent and graduated for easy-to-see measurement. Keep several at the ready for applications where one tub after another will be used. They can be cleaned with acetone for multiple uses. One-quart (32 oz.) 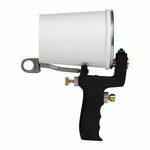 Disposable Paper Tubs (#887) fit snugly into the gel coat cup gun, #120-A, for use with spray-on applications. 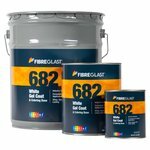 Tubs are unwaxed, but poly-lined, so as to not get soggy during use. After use, simply dispose of tubs to ensure a clean, safe shop. Plastic Tubs (#121-A), when ordered alone, will typically ship in a small box. Single sleeves of cups (#887-A), when ordered alone, will typically ship in a medium box. Where possible, we will combine ordered items to reduce the number of boxes shipped. The case of cups (#887-B) will ship in a large box. 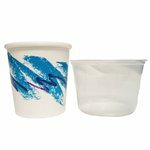 One quart paper cups (#121) are sold in a sleeve of 25 (#887-A) and a case of 500 (#887-B). One quart plastic cups are sold by the unit. 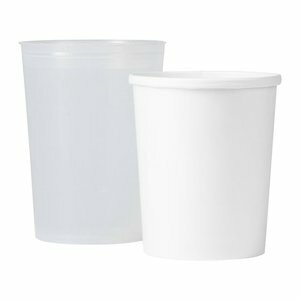 *Quantity discounts are available when 10 or more of this same cup are purchase in one order.